Marrickville Soldiers Memorial Fund was established by the Marrickville community in 1916 to collect subscriptions and donations towards the creation of a Memorial to remember those soldiers that died during the First World War. The Honorary Secretary of the Fund was the Marrickville Town Clerk Henry Terbutt Brown who received numerous letters through the Marrickville Council offices. Many of these letters included donations towards the fund. Mrs Rogers, a grocer living on Terrace Road, Dulwich Hill donated one pound towards the fund. This was roughly one third of a weekly wage in 1916. Other members of the community elected to use their skills to create goods to include in a raffle to raise money for the Fund. One Miss Saunders created an autographed traycloth which she raffled off to raise £5 10s. Through a range of donations and different initiatives by the Marrickville community, the Fund had raised over £460 towards the Memorial. 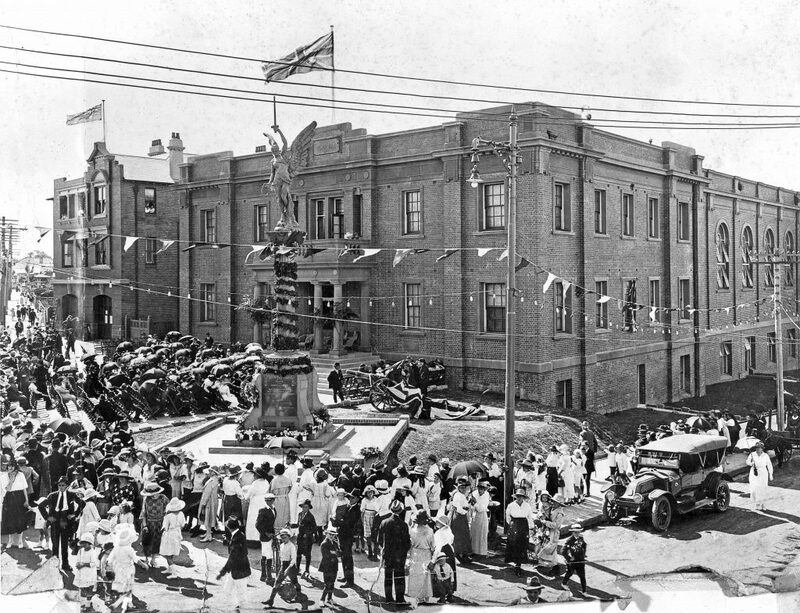 In early 1917 a meeting of the Fund’s subscribers met to discuss a proposed location for the Memorial. It was a simple decision to recommend the corner of Marrickville Road and Petersham Road. Marrickville Council had purchased the land in 1911 as the site of a future Town Hall. The proposal went before Marrickville Council on 29 January 1917, who not only endorsed the recommendation, but also requested that the Parks committee present a report to ‘beautify’ the site. The same day the decision went to Council, the Memorial Fund placed an advertisement calling for competitive designs for a Soldiers Memorial Monument, with a cost not to exceed £500. Two days later Samuel Warke, a fireman who enlisted from 182 Enmore Road, Marrickville, died of his wounds in the Epiliotic and Paralysis Hospital, London. He had been treated there since being wound at Pozieres in July, 1916.